Ovarian cancer is almost always diagnosed at a later stage, after it has spread beyond the ovaries and is difficult to treat. That’s one of the reasons it continues to have the highest mortality rate of all women’s cancers. There is no effective screening or early detection available, so the Familial Ovarian Cancer Clinic (FOCC) at Women’s College Hospital (WCH) is focused on prevention. The clinic’s goal is to stop cancer from ever developing in high-risk women, such as those with BRCA1 or BRCA2 mutations. Clinic co-director Dr. Michelle Jacobson describes the FOCC as a comprehensive, full-service clinic offering high-risk women options that reduce their risks across their reproductive lives. “That may start as early as contraception counselling, for young women who are worried about what kind of hormones are safe to take because they’re concerned about both their breast and ovarian cancer risk,” Dr. Jacobson says, explaining that taking hormones – such as birth control pills – can increase breast cancer risks in women with BRCA mutations, although the same hormones may protect against ovarian cancer. The clinic at WCH offers the full range of ovarian cancer risk-reduction surgeries, including removal of the fallopian tubes (salpingectomy), removal of the ovaries and fallopian tubes (salpingo-oophorectomy), and removal of the uterus, ovaries and fallopian tubes (hysterectomy and salpingo-oophorectomy). 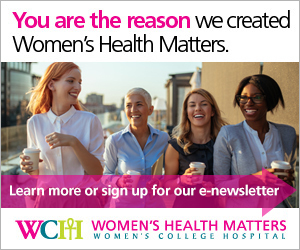 While removal of the ovaries prevents ovarian cancer, it also puts a woman into surgical menopause, which can induce vasomotor symptoms like hot flashes, and genitourinary symptoms such as vaginal dryness, and also increases risks for osteoporosis and cardiovascular disease. “Menopause management is a discussion based on the individual patient,” Dr. Jacobson says. In the general population, the most effective treatment for menopausal symptoms is hormone therapy, but that may not be an option for some women with BRCA mutations. Because of the implications of early surgical menopause, there are cases in which removing just the fallopian tubes and leaving the ovaries in place until a later date may be an option. “It’s pretty well established that high-grade serous cancer does not originate in the ovary, but originates in the fallopian tube, so there’s good rationale that removing the fallopian tubes can be risk-reducing,” says clinic co-director Dr. Marcus Bernardini. However, because the fallopian tubes and the ovaries are in close contact, it’s impossible to be certain that every last fallopian tube cell has been surgically removed without also removing the ovaries. For that reason, the risk reduction from removing the fallopian tubes alone may not match that of a salpingo-oophorectomy. “We think that certainly removing the fallopian tubes will reduce risk. Does it reduce to the same degree as if you take the entire complex of the ovary? We’re not sure. Obviously it doesn’t have the other protective effects that removing the ovary does, such as protection against breast cancer down the line. So the recommendations for treatment today are still the removal of both the ovaries and the fallopian tubes,” Dr. Bernardini says. That recommendation may need to balanced with other factors in some patients. Dr. Bernardini gives the hypothetical example of a 36-year-old woman with a BRCA1 mutation, who has already had breast cancer and will not be able to take hormones to help manage menopausal symptoms. The first hurdle in preventing ovarian cancer is identifying women at high risk. When researchers first discovered that BRCA1 and BRCA2 mutations were linked to increased risk of ovarian cancer in addition to breast cancer, it was believed that BRCA mutations were involved in about 10 per cent of ovarian cancers. However, more recent research has shown that BRCA mutation is most strongly linked to one specific subtype of ovarian cancer: high-grade serous ovarian cancer. “When you look at just this population of ovarian cancers, BRCA rates are higher than 10 per cent, and some literature shows they may be as high as 20 per cent,” Dr. Bernardini says. That discovery spurred an increase in genetic testing for women who have this subtype of cancer, which also increased the number of ovarian cancer patients who were identified as having BRCA mutations. In turn, this led to testing of family members of those women, and the identification of people who had BRCA mutations who had not yet developed ovarian cancer, but who were at high risk and can benefit from risk reduction. “So you’re going to have much larger population of individuals who are now at risk,” Dr. Bernardini says. In addition, the Prevent Ovarian Cancer Program (POCP) at Princess Margaret Hospital is making testing available to a group of women who would not otherwise be eligible for testing: the daughters of women who died of high-grade serous ovarian cancer. Before 2010, only about 20 per cent of women with this subtype of cancer were tested for BRCA mutations, so their families do not know if the cancer was related to a mutation. “These family members don’t qualify for testing, but we know that their theoretical risk may be upwards of 10 per cent for having a mutation,” Dr. Bernardini says. Women with BRCA are also at high risk for breast cancer, but risk reduction strategies differ between the two types of cancer. Although breast cancer is more common than ovarian cancer, it also has screening options such as mammography. That’s why the FOCC is changing the focus to risk reduction in women with high genetic risks.